3. Which one of the following principles is not related to effective communication ? 4. 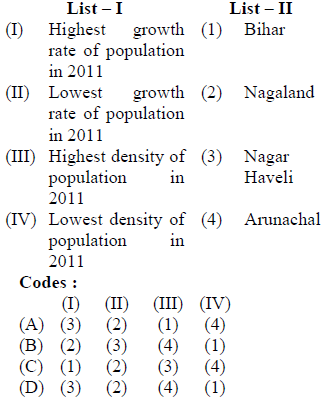 Which one of the following states registered negative population growth between 2001-2011 ? 11. 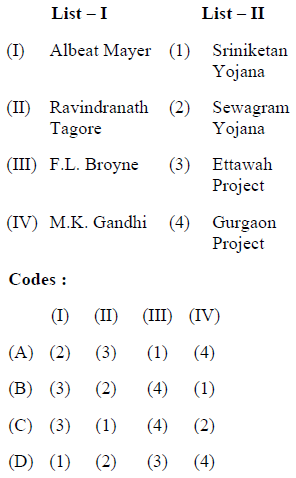 Which programme was launched by the prime minister of India on 8th September 2009 ? 14. 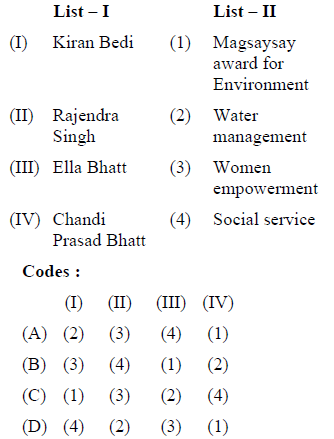 Which of the following schemes is an effort to improve medical services in rural India ? 17. Which of the following books written by Paulo Friere ? 19. Who funded to establish PERCs in India ? 20. ‘My life is a message’ this is written by whom ? 21. Which of the following three R’s is the concept of life long education is one well suited to our times and conditions ? 22. Right to Information Act was enforced in which year ? 23. Which one of the following centres functions as continuing education centres ? 24. Quality of life improvement programme is part of which National Programme ? 27. 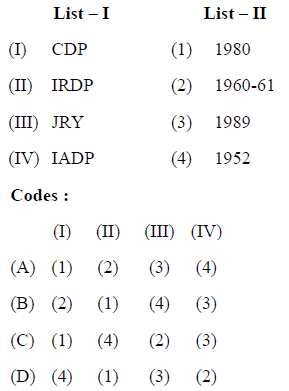 Which of the following State was motivated to fight against arrack shop through adult education centre ? 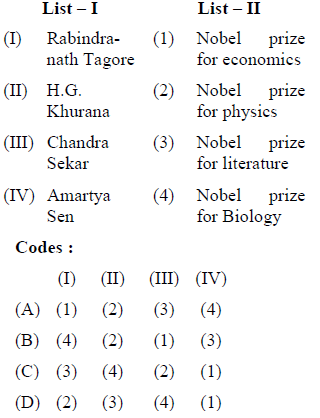 28. Who was the first education minister of India after Independence ? 29. 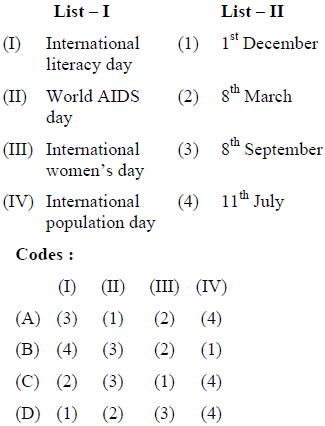 Which of the following centre provides training and reading materials for literacy and continuing education programmes ? 30. What is the main aim of the Sarva Shiksha Abhiyan, is one of the flagship programmes of Government of India ? 44. Assertion (A) : Leaders are the products of a given situation. Reason (R) : Leader emerges out of situation. 45. Assertion (A) : Motivation is a hypothetical construct for learning. Reason (R) : Motivation can not do other than team work. 46. Assertion (A) : The Joint Family System has broken down in India. Reason (R) : Industrialization has created a great demand for working hands. 47. Assertion (A) : The Hindu Marriage Act 1955 introduced a significant change in women status in India. Reason (R) : Polygamy let do increase the number of divorces. 48. 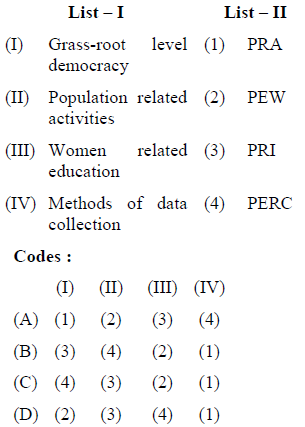 Assertion (A) : Social education tries to make the adult ideal citizens. Reason (R) : Social education imparts the knowledge of the problems of the world of adults. 49. Assertion (A) : Social, Political, and economic, equality is absolutely necessary for the success of democracy. Reason (R) : To some extent the problems of democracy can be solved through equality. 50. Assertion (A) : The unemployment problems of the rural areas can be solved by economic reconstruction. Reason (R) : There are many serious problems in rural areas and unemployment is one of them. 51. 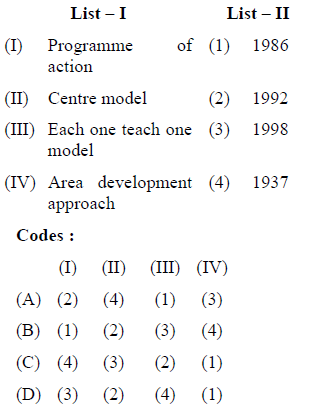 Assertion (A) : Community development is a process controlled by the community itself. Reason (R) : Community development programmes are basically introduced & implemented by the community. 52. Assertion (A) : The panchayats are making considerable progress in the rural development in India. Reason (R) : The rights of panchayats should be increased for rural development in India. 53. Assertion (A) : Extension as third dimension aims at promoting a meaningful and sustained rapport between the university and the community. Reason (R) : One of the goal of university grants commission is to transform the university system in an active instrument for social change. 73. Which one of the following is very important for empowerment women ? 74. Why do women lag behind men in India ?